Yesterday I had a dream that I was walking and following my uncle, whom I address as Periyamama, into a Siva Temple. 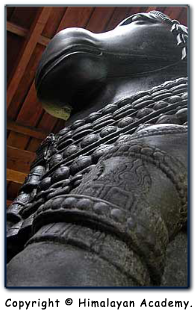 I have never been to this temple before but it had a huge nandi statue in front of the entrance. [Throughout the dream, Periyamama never looked nor spoke to me like he normally does.] As we entered the temple, he walked past a Ganesha vigraham and a Sivalingam. He sat on one side of the temple and entered into meditation. After paying my obeisance to Ganesha and Siva, I then proceeded to sit with a small crowd who were gathered around a Swami. He was unknown to me, wearing an ochre robe and was fair-skinned (like a white man). After he finished advising the people who gathered around him, he came to me and advised me to pray to the big Nandi Vahana statue (Siva's vehicle) in front of the Sivalingam. He said that all the Gods are in the vahana. Then Periyamama (Muruhan?) led me out of the temple. I recall that both of us were wearing veshtis. We both entered my other uncle's van (Sri Mama). Then Murugan? (Periyamama) instructed Sri Mama to give me a stackful of books containing Tamil writings. Sri Mama placed it on my lap and we all left the temple. As I examined the books in my lap, I noticed that it contained many hymns of Thevaaram by Sambandar, Appar, and Sundarar. I then awoke. I think Murugan wants me to learn the Thevaaram hymns. Strangely enough, yesterday, I had a dream which reminded me of the previous dream I had exactly one year ago [see above experience]. Exactly one year later, I had another dream telling me to learn Thevaaram and Thiruppugal hymns. In this dream, I was instructed by Lord Murugan to learn more Thevaaram and Thiruppugal hymns. I heard a voice from above - no form could I see - only a voice (asa-reeri) that asked me, "Why haven't I started singing?" I responded to this voice above by saying, "I cannot learn them since I did not know how to sing them because I cannot read nor speak Tamil." I further added, "The people who sing them are music professionals and I cannot sing like them. I don't have any books to learn from." The voice then said, "Go and ask him (Periyamama) and he will help you." Murugan then showed me a vision of my uncle (Periyamama) with me when I was a 8 years old. We were in my uncle's old apartment in Regina. He was seated on his couch and was singing a song, which I could not recall. In this entire dream, Lord Murugan was simply a voice. He did not show His form to me like He normally does. He was a voice that spoke to and directed me from above. I was able to respond and talk to the voice (in English) but I could not see Him. I recognized it was Lord Murugan by the way He spoke. It was the same sweet and loving tone that I recognized from my earlier dreams with Him. This dream disclosed a few truths which I did not notice during my last dream in 2001. It really was Murugan who appeared to me over a year ago and gave me a book of hymns to learn. In addition, I recall my uncle saying that Lord Murugan is the God of Tamil. He is the protector of that divine language and it is His responsibility to see that nothing will ever happen to it. Hence, this dream supports my uncle's statement regarding Lord Murugan. This dream also shows that Murugan really does want me to learn them and thus, pass the knowledge and wisdom inherent in the Thevaaram hymns to inspire other devotees who come to the temple. As I was visiting spiritual websites on the internet, I happened to visit a website called gurudeva.org and took a glimpse of some pictures that I reminded me of a dream that I had three years ago. The pictures I saw today on gurudeva.org helped me put the various aspects of that dream together. In "Learn Thevaaram (Part 1)" [see above], I had a dream of a white swami who instructed me to pray to a big Nandi Vahana statue [see below]. The temple I was in was one that I had never before visited; it was a Siva temple. Also the swami appeared like a white man dressed in an orange ochre robe. Three years later my answer came as to where I was in my dream three years ago! Here are photos of the temple entrance on Kauai. 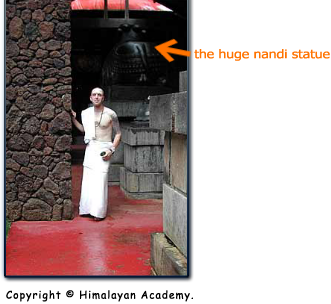 In front of the entrance is a large Nandi statue, which looks identical to the one I envisioned in my dream three years ago! 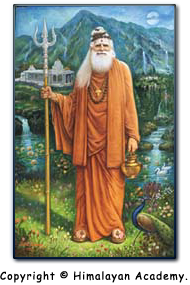 The swami I also saw in the dream, I now know to be Satguru Sivaya Subramuniyaswami (or Gurudeva; as called by His devotees). And the Siva temple I was in was the Kadavul Hindu Temple on Kauai! I can only conclude that I must have travelled astrally to Kauai three years ago with Lord Murugan to the Kadavul Hindu Temple to be instructed to learn the sacred Thevaaram hymns.